Tuesday may have marked the beginning of the end of the race for the Democratic nomination. Hillary Clinton won the big, blue state of New York much the way she won the small, red state of South Carolina: by running a locally tailored campaign that nonetheless treated the state as a stage for the issues and constituencies that will matter throughout the primaries, and into November. If South Carolina marked the end of the beginning of the Democratic primary race, as Clinton’s 86-14 win with black voters showed the trouble Sanders would have with that crucial if internally diverse voting bloc, New York marked the beginning of the end, and for some of the same reasons. Clinton ran as a New Yorker, surrounding herself with local elected officials, harkening back to the (first) Clinton administration (which was staffed by Mayor Bill de Blasio and Governor Andrew Cuomo, both of whom introduced her at her Sheraton victory party), boring into issues of guns and housing and mass transit, and reminding voters at every stop that she fought for the Zadroga Act, which brought funding for 9/11 rescue workers made ill by their jobs there. “You need a president who knows where Co-op City is!” she told the mostly black and Latino crowd at that enormous housing development in the Bronx last week. Co-op City also happens to be the largest polling place in the country; Clinton won it 3-to-1. Sanders had pulled an estimated 18,000 to an outdoor festival in the South Bronx in early April; Clinton filled the local community center with about 1,000. But as Dewayne Phillips told me there, that night: “Supporters of Bernie love rallies. Supporters of Hillary love to vote.” Indeed, the Bronx went 70-30 for Clinton. (Full disclosure: My daughter was the campaign’s Bronx organizer). 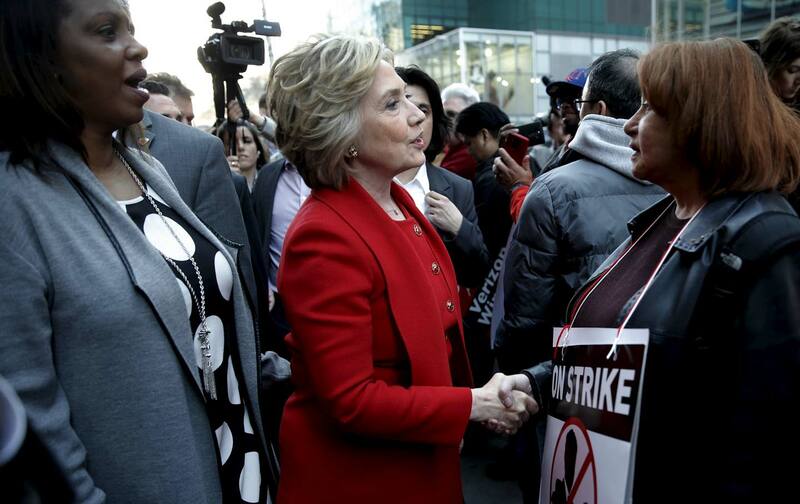 I saw the size and shape of Clinton’s victory not only at her rally in Co-op City but also at Medgar Evers College in Brooklyn earlier this month, at an intimate event (by Sanders campaign standards) attended mostly by black and Latina women. The progressive Public Advocate Tish James hailed Clinton’s fight against guns, while first lady Chirlane McCray talked of her work going back to the Children’s Defense Fund. But the stars of the event were two local women: Gwen Carr, the mother of Eric Garner, who was killed by the New York Police Department for selling loose cigarettes; and Nicole Bell, the fiancée of Sean Bell, killed by the NYPD on the morning of their wedding. The support of women like Carr and Bell buoyed Clinton, which I saw in South Carolina, too, where she was first joined by the so-called “Mothers of the Movement.” Carr joked that Clinton “caught daggers in her teeth and threw them back” at the Benghazi committee hearing last October; Carr and the other mothers were just as fierce in their advocacy for Clinton, all around New York City. The Sanders campaign will complain, with some justification, that it was hopelessly disadvantaged by New York’s byzantine (and tough on voters) registration laws in this closed primary. As numerous supporters complained on social media, anyone who wasn’t registered as a Democrat had to change their registration back in October, which is a ridiculously long period of time before an election. On the other hand: The campaign didn’t invest much in making sure their supporters were correctly registered back then. As the Sanders revolution goes forward, taking on the patchwork of discouraging voter-registration laws across the country ought to be on the agenda. Ultimately, though, Sanders was undone by the same demographic forces that have bedeviled him beyond heavily white states like Vermont, New Hampshire, and Wisconsin: his failure to make inroads with voters of color. Though he’s won high-profile black and Latino surrogates—Spike Lee, Killer Mike, Rosario Dawson, and Danny Glover—and showcased them in New York, it gave his campaign a flyover feel, like he hadn’t done the tedious work of winning over local elected officials and the neighborhood activists who dominate a Democratic Party primary, especially in a city like this. And that’s because he hadn’t. It’s a painful irony that a campaign that’s powered by grassroots contributors and a true bottom-up fundraising juggernaut has not been able to cultivate those same grassroots at the local level. The white Sanders supporter wearing a Bernie wig outside my Harlem polling place got a lot of laughs Tuesday, but Clinton got a lot of votes, winning the precinct 60-40. Despite the heft and importance of Sanders’s economic ideas, too often his New York campaign favored spectacle over substance. All of which makes campaign manager Jeff Weaver’s comments after the primary loss that much more discouraging. He told MSNBC’s Steve Kornacki that the campaign would “absolutely” fight to flip superdelegates at the July convention, even if Clinton continues to lead in both pledged delegates and the popular vote, because of polls showing Sanders slightly trailing Clinton in national polls. That would certainly make the July convention a spectacle, but it’s unlikely to help his candidate win. “The superdelegates have never catapulted anyone in second place into the nomination,” Clinton spokesperson Brian Fallon told me Tuesday night, noting that the top Sanders strategist, Tad Devine, was an architect of the system. In 2008 Devine argued in an op-ed that “the appropriate role of the super delegates is to ratify the leader in pledged delegates,” Fallon observed, and he predicted that’s what they will do in July. For his part, Devine has been less provocative than Weaver since the New York loss, telling reporters the campaign will look at its status after next week’s five primary elections, all in states where Clinton is currently leading. Clinton should be proud of her New York results. But she should be chastened by exit polls showing that even in the state that’s home to Wall Street, most Democrats share Sanders’ views on the finance industry: Two-thirds said Wall Street “hurts the economy”; only a third said it “helps.” If she’s the nominee, as is looking almost certain now, she will lead a Democratic Party that has shifted sharply to the left, particularly on economic issues, since the last time she ran to be its nominee eight years ago. A victory in November will require mobilizing the Sanders supporters who have played a role in that long-overdue party shift.